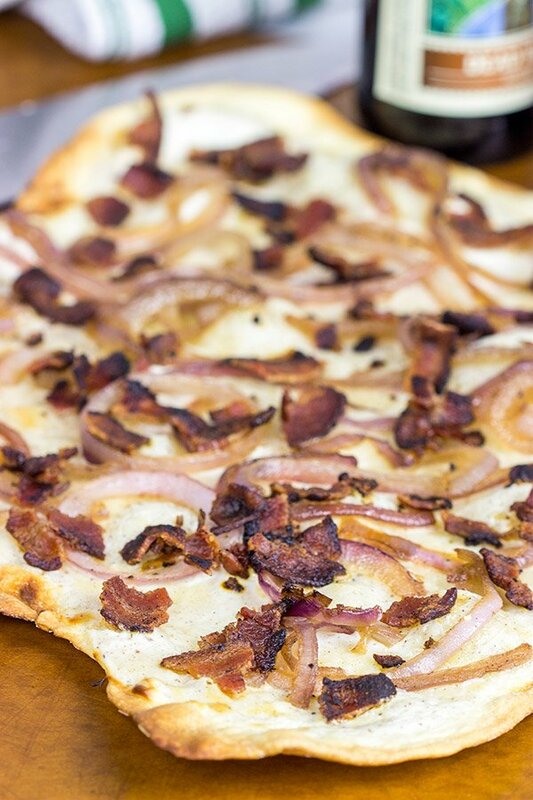 Flammkuchen, or tarte flambée in French, is a German-style thin-crust “pizza” topped with bacon and onions…and it’s delicious! I’ve always loved a good college town. In the US, a college town is typically one with a main street lined with bookstores, coffee shops and awesome hole-in-wall restaurants. In Europe, a college town often features amazing skylines dominated by Gothic style architecture. 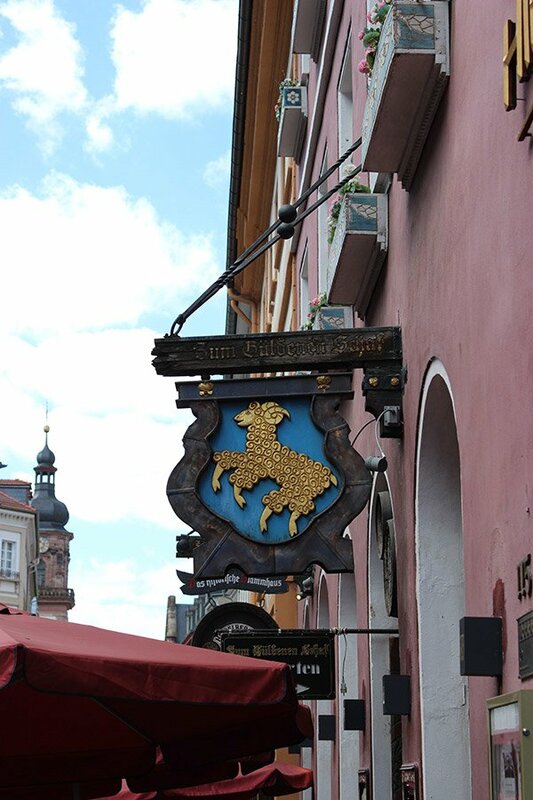 This past summer, Laura and I visited Heidelberg, Germany as part of our Viking River Cruise down the Rhine River. Heidelberg is hands-down one of the most beautiful cityscapes I’ve ever seen, and you can get amazing views of the town from the ruins of Heidelberg Castle. 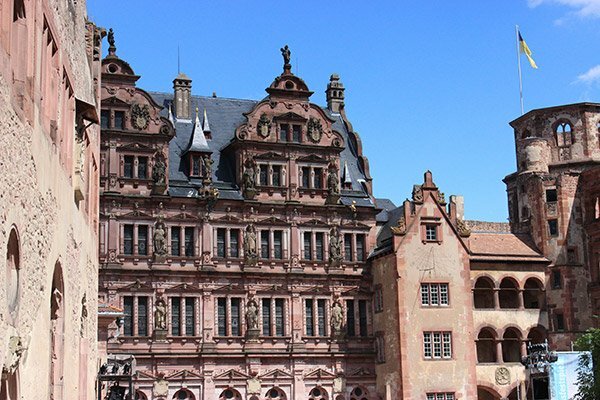 Heidelberg is also one of Europe’s oldest university towns. At its height, the castle housed the world’s largest wine barrel. 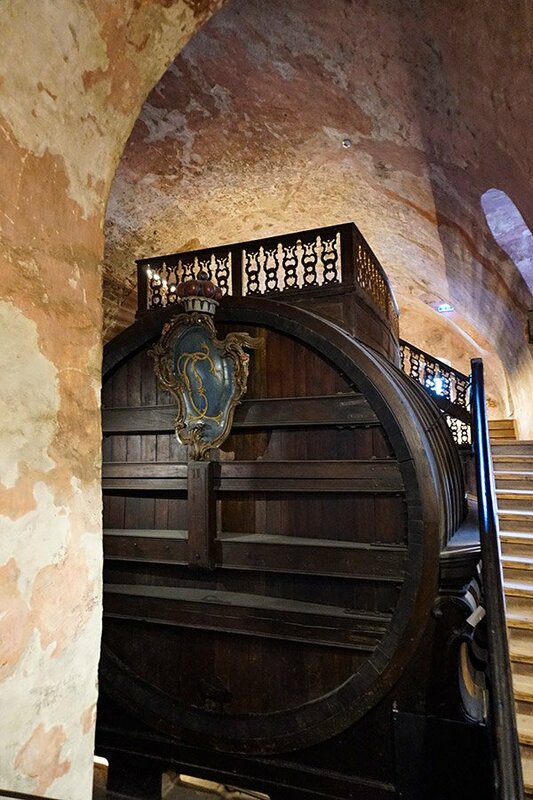 That wine barrel (known as the Heidelberg Tun) is capable of holding 58,000 gallons of wine, and it still holds the record of world’s largest wine barrel (although it’s no longer in use today). Now, with that said, it’s worth noting that the wine was likely not very good. In fact, it was probably downright bad. That’s because the local residents were allowed to pay their taxes in wine, so they would bring the appropriate amount of their homemade wine to the castle and pour it into the barrel. So all of that homemade wine got mixed together, and I’m going to take a guess that it just didn’t taste that great. Just a guess! After touring the castle, we spent part of the day wandering around Old Town Heidelberg before we made our way back to the ship. While we passed a number of delicious restaurants in town, Laura and I just weren’t hungry. By this point, we’d eaten our way across Europe for over a week, and so we opted to skip lunch in favor of wandering through the cobblestone-lined streets and alleys of Heidelberg. We made our way over to Heidelberg University (one of Europe’s oldest universities) where we watched several students engaged in a rather spirited match of checkers. Kinda cool! While Laura and I did our fair share of eating and snacking in towns along the Rhine River, I must note that the food on our Viking ship was impeccable. Seriously! Going in, I was a bit skeptical about the food as feeding a crowd of 200 people at the same time isn’t easy. But Laura and I came away from every meal impressed by not only the presentation, but the taste. One night, I was so full that I just opted for a cheese plate for dinner…and the cheese plate was huge! It featured all sorts of exotic and delicious cheeses, and I definitely ate every bit of it. I have a weakness for cheese! As part of their onboard entertainment, Viking hosted several cooking classes featuring local food and drink. That’s where we first discovered Flammkuchen. I like to call Flammkuchen a German-style pizza, but I’m not entirely sure that does this recipe justice. 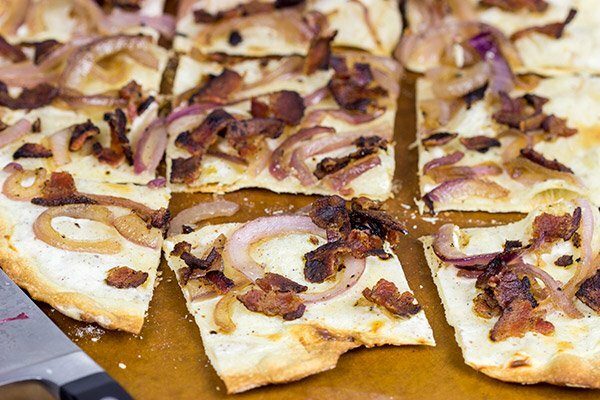 Flammkuchen features a very, very thin crust (almost like a cracker) that is traditionally topped with sour cream, onions and bacon. 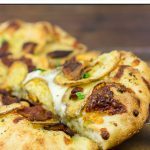 Yes, sour cream on a “pizza.” Oh, and there’s a pinch of nutmeg in that sour cream topping, too. (To be fair, an authentic Flammkuchen uses crème fraîche, but crème fraîche isn’t easy to find in stores, so I opted for sour cream.) While that topping might sound a little suspect, I recommend giving it a shot. Flammkuchen is quite delicious! After learning about Flammkuchen in the cooking class on the ship, I finally got around to recreating this one at home. It’s really not that hard to make at all. Yes, you do make your own dough. But that dough doesn’t involve yeast. (I know some folks shy away from making yeasted doughs at home.) While the dough is resting, you cook up the bacon and then saute the onions in the bacon fat. Just stop and think about that for a moment. Onions sauteed in bacon fat. They’re every bit as delicious as you might imagine! Then just roll out the dough super thin (and I do mean super thin) and top it with sour cream, onions and bacon. Did I mention that the onions are cooked in bacon fat? 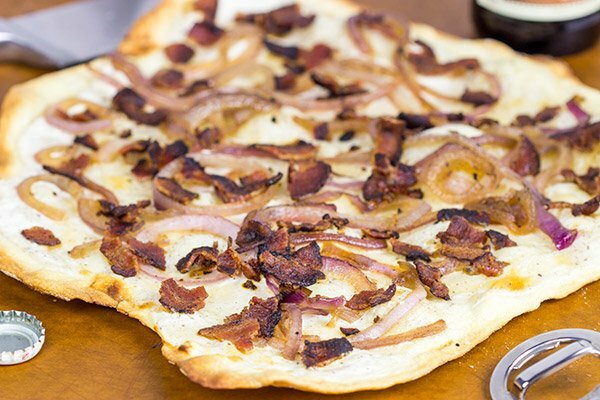 Flammkuchen, also known as a tarte flambée in French, is roughly translated as ‘flame cake.’ It is indeed baked at a high temperature (475°F), and I highly recommend using a pizza stone if you have one. 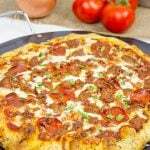 (This recipe makes two Flammkuchen, so we baked one on the stone and one on a sheet pan. The one baked on the stone was noticeably better!) Flammkuchen is a common menu item in southern Germany and northeastern France, and you can often find them with added ingredients like mushrooms, gruyere cheese or munster cheese. You can also create a dessert version of Flammkuchen using apples and cinnamon, and that one is definitely on my list of things to make on a lazy weekend day sometime soon! If you don’t have any plans to visit Germany soon, then I highly, highly recommend trying your hand at Flammkuchen at home. It’s not overly complicated. Oh, and did I mention that the onions are cooked in bacon fat? Laura and I shared this Flammkuchen over some Oktoberfest beer from Ballast Point Brewery that I stuck away last Fall (and then promptly forgot about). It just seemed appropriate that this classic German pub food should be served with a classic German beer. No matter how you serve it, I do hope you enjoy this one! Cheers, friends! Using a large bowl, combine flour and salt. Add oil and water; mix until well combined. Knead dough for 5-6 minutes, or until smooth and well combined. Cover lightly with plastic wrap and let rest for 30 minutes. Line a baking sheet with parchment paper; dust parchment paper with flour and set aside. In a small bowl, whisk together sour cream, milk and nutmeg; set aside. Using a small skillet, cook bacon until lightly crispy. Remove bacon from pan and set aside. Place sliced onions in skillet with bacon fat. Cook for 3-4 minutes, or until onions begin to soften. Divide dough into 2 equal-sized portions. Working with one piece at a time, roll dough until very thin (1/8”). Place dough on prepared baking sheet. Repeat process with remaining piece of dough. Dock (poke holes with fork) both pieces of dough. 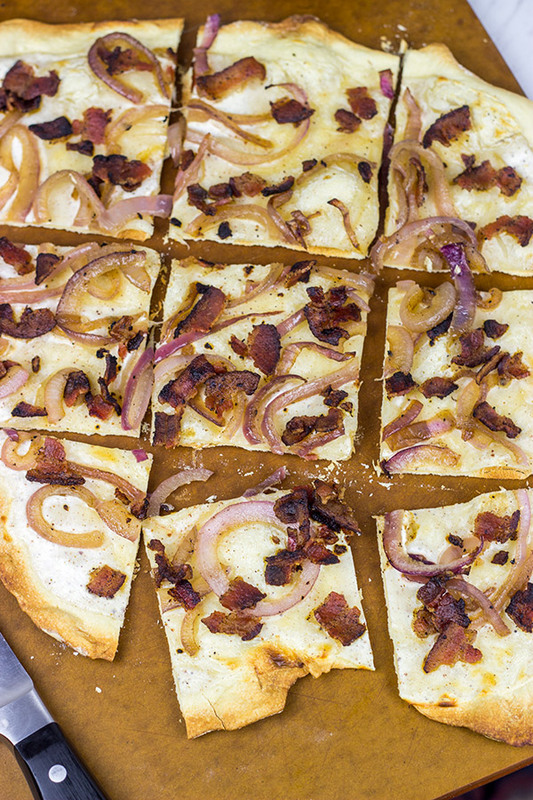 Divide sour cream, onions and bacon evenly over two pieces of dough. Bake on lowest rack of oven at 475°F for 8-12 minutes, or until edges are golden brown and toppings are crispy. I have a weakness for cheese too and could totally just have a cheese plate for dinner…and totally would eat it all too 😉 I’ve never been to Germany but it sounds like you guys had an awesome time! What a cruise, I’m sure! I have a pizza stone home and the ingredients to this one looks pretty simple so going to have to try this one out….with beer, of course 🙂 Hope you have an awesome week! Oh, you should totally try making Flammkuchen at home, Dawn! I know it might sound a little odd, but it’s seriously amazing! And it really isn’t that difficult to make at all. Hope your week is off to a great start, too, my friend! There’s nothing like a college town! I grew up in one and have a weakness for a good college town hole-in-the-wall restaurant :). But I didn’t realize that Heidelberg is a college town. That’s so cool, and yet another reason to visit that gorgeous city. Also, I would like to suggest that we petition the government to allow us to pay taxes in wine. Tax day would be so much more fun. I’ve never had flammkuchen but it sounds delicious. Happy Monday, David! I gotta admit…I’m a bit jealous that you grew up in a college town. It’s probably one of those things that you didn’t realize how cool it was until you moved away later. But, yes, Heidelberg is one of western Europe’s most amazing college towns. We’re just talking a few hundred years older than our college towns…haha. Thanks, Kelsie! I so enjoyed this post, David! Such a fascinating story of that wine-barrel and tax paying options back in the day! I was at the Unified Wine and Grape Symposium last week and my head is overflowing with wine stories and facts! And woa – I’m wishing this college town I live in had a castle as glorious to look at and wonder around in as Heidelberg Castle! Also, so cool that Viking offered cooking classes featuring foods native to the lands y’all were traveling through – if not for which, I wouldn’t be feasting my eyes on this German-style pizza with B.A.C.O.N.!!! Happy Monday, my friend, hope y’all had a wonderful weekend! The Unified Wine and Grape Symposium? That sounds fascinating, Shashi! I’ve never heard of it, but it sounds like somewhere I need to be…because, well, wine. 🙂 You do now live in one of the best college towns in the country. Seriously! I’ve seen Athens pop up on top college town lists all the time! We did indeed have a good weekend here, and the week is looking good so far. Of course, it would be looking better if I had some of this Flammkuchen waiting on me for dinner tonight! Haha! 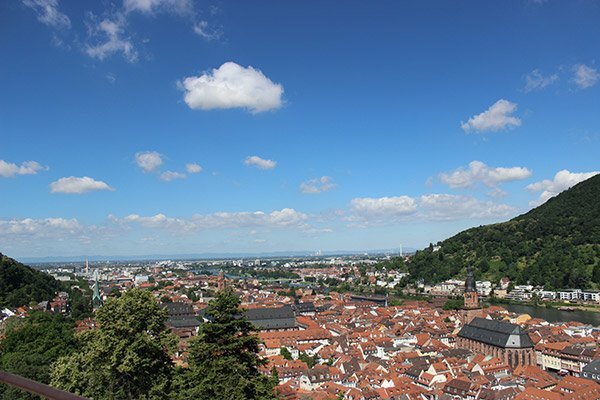 David – you make me want to go to Heidelberg! Germany is a place I’ve not yet visited, and now I can’t wait to go and see that lovely castle! I’m thinking, too, that Flammkuchen might me on my dinner table this week. (The onions in bacon grease convinced me.). This easy recipe sounds like a winner! I took the train to Heidelberg from Italy and it was lovely, the cruise sounds fabulous! Makes me want to go back to Europe! I’ve been to Heidelberg! It was incredible and Il loved it, the food the architecture, the people, all of it was simply amazing. 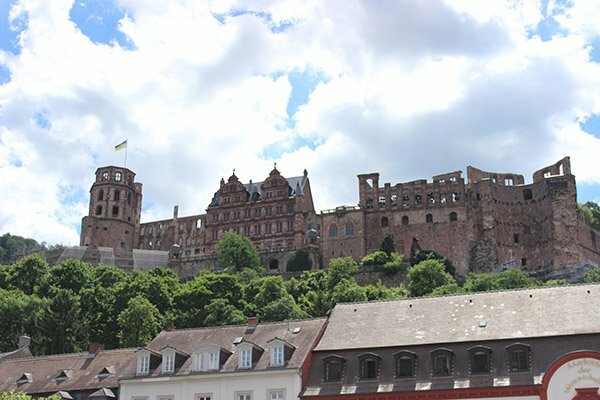 I’m planing my next cruise with my honey and of course I want to go to Canada he wants to go somewhere warm but we both agree one day soon we have to do a Viking River Cruise 🙂 The Heidelberg Castle was like nothing I’ve never seen. I wish we had castles in the US. I’ve never heard of Flammkuchen? I’m going to try this out, it looks mighty tasty. Yes! I love that we’ve been to the same place, Mary. 🙂 And I agree that Heidelberg is just an amazing town. You absolutely, 100% (no, 110%) MUST do a Viking River Cruise. We had the best time on that cruise, and we saw so many places that we might not otherwise have visited. Thanks so much for the kind comments, my friend! What an amazing trip! I love all the pictures. This flammkuchen looks amazing too! I could eat that and a glass of wine (not from the community keg!) for dinner! Haha…yes, let’s skip that community keg. But I agree! Pour yourself a nice glass of wine and serve up Flammkuchen. It sounds funny, but trust me on this one. This is one delicious meal! 🙂 Thanks, Kathy!! Wow, this sounds really good. I’ve never had anything like it. Heidelberg really is a beautiful place, David! I haven’t seen many of the European places yet, but I certainly did like Sweden. Once we visited…mmm…I’m so bad with names, I believe, Uppsala, which is famous for its old university. I agree – this places have a very special ambience! And this flatbread, although being minimalistic, has its own charm too. Sour cream is an interesting touch. Bacon, onions and sour cream? Heck yeah this sounds like a winner. This seems like a real interesting recipe David, thanks for sharing! Buuuut I gotta say I’m super jealous after reading about your trip to Germany. I bet that was just jaw-droppingly awesome! Plus a legitimate castle, that’s so sweet. Something about the fact that it was damaged during a war makes it even cooler haha. Great post!! I know you’re probably thinking the sour cream is a bit of a strange addition here, but trust me, Matt. It’s good. Like really good! The trip to Germany was indeed amazing! 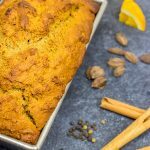 I love exploring Europe, and that trip certainly introduced me to a bunch of new recipes. After all, the food is half of the fun for me when we travel. (Ok, ok, it’s more than half…haha.) Cheers, my friend! I love all of your pictures. They all look great, now I really want to go to Germany. This flammkuchen looks delicious. I love the crisp crust. absolutely stunning town, wow so pretty! thanks for sharing David, I had fun reading everything! Thank you so much, Manali! 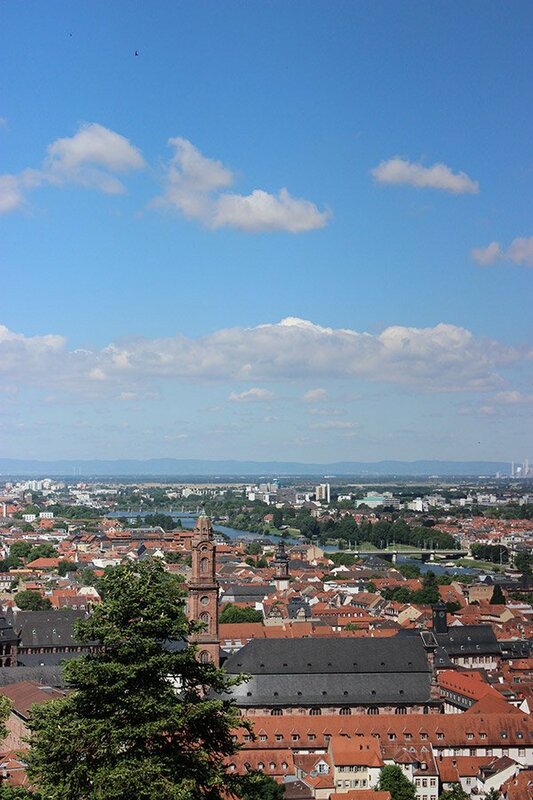 We loved Heidelberg…I’m a sucker for college towns. 🙂 And it’s been fun to relive those vacation memories thanks to blog posts, too! Hope you’re doing well, my friend! 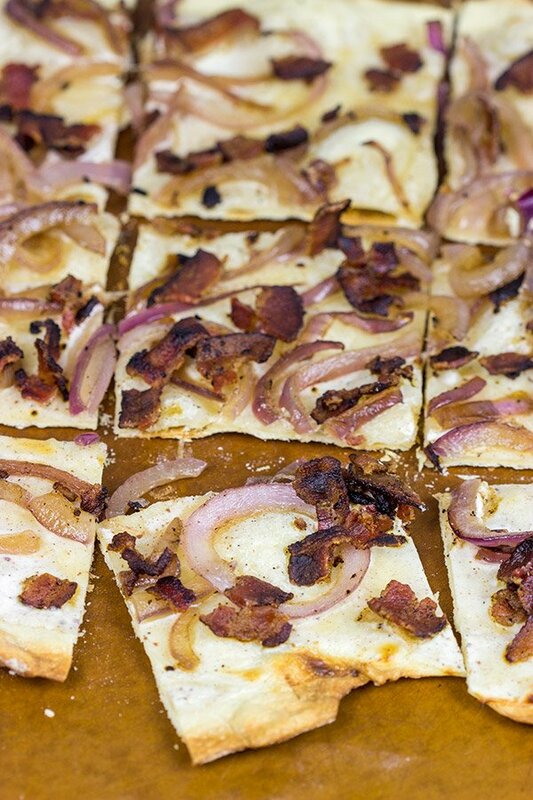 Your flammkuchen looks great. I can remember the first time I had flammkuchen or tarte flambée, it was in the Alsace section of France. It was so good that we had to order a second one. Thank you for reminding that I need to make it again. BTW, I’m glad you liked the food on your Viking river cruise, many of our friends that have been on river cruises said the food was just OK and as you have said, food is half the reason we travel.